Since 1991, Systems Plus—an agile, financially sound small business—has achieved success for defense and civilian agencies through our specialized business practices. Systems Plus is a global transformational solutions provider with extensive experience in delivering business services and information technology (IT) solutions that solve complex business problems. Systems Plus is driven to achieve high standards of performance and customer satisfaction. Systems Plus provides services through a wide range of contract vehicles that include a full current GSA schedule of contracts. We are proud of our high retention rate of personnel due to our methodical employment of highly qualified professionals who are experienced in change management, customer relationship management, knowledge management, change and project management methodologies, system integration, systems architecture, database architecture and customer support services. 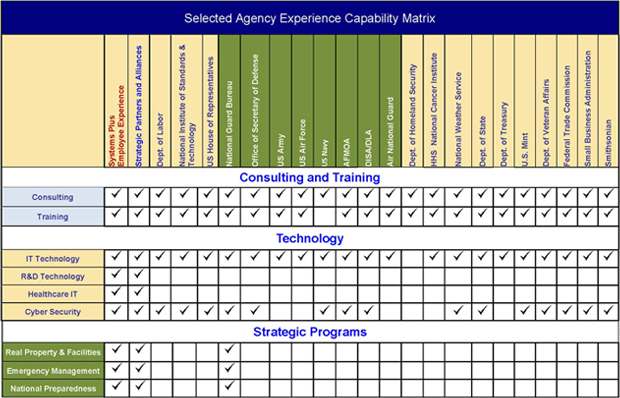 Our experience spans the broad spectrum of the Federal sector in the following Business Practices.